We have been hosting our annual Economic Outlook breakfast since January of 2009. If you were unable to attend, fear not as I’ve boiled down the main points. This is our favorite event of the year as we visit with long-term clients, catch up with fellow professionals in our community, and meet potential new clients. It is also a fantastic way for us to share our thoughts on the year that passed while using current data to produce a fresh view forward on state of the economy. The goal is to get the correct information into the hands of our clients and translate this into the context of real financial plans. What I’ve learned about this process over the years is that no economic forecast is perfect. All the best economists and investment strategists openly admit this. The good ones take a sober look at incredibly complex data and acknowledge how multifaceted the world economy is. The bad ones push their view as gospel and pray they are correct in hopes of making a name for themselves and taking the next spot on CNBC. The BIG story from last year was the US Market suffering its first down year since 2008 with the S&P 500 off 4.4%. The S&P 500 was positive 11% for the year through September 20th. Things change fast in investing1. The market dropped 19.8% in just 95 days between mid-September and Christmas Eve and delivered the worst month of December (-9%) since 20092. It’s extremely interesting that the market would end its descent on a closing basis at 19.8%. Some economists will argue that we must see a closing low of 20% or more to signify a BEAR Market. Other economist will call this the end of the long-running BULL as we hit an intra-day trading low of greater than 20% during the December 24th session. If this is the end of the 2nd longest BULL in history, then the stats for this run are incredible. Since the March 9th, 2009 beginning of the BULL, the S&P 500 gained 423% including reinvestment of dividends, over 3,482 days. That is good for an average annual return of 18.95%3. I mentioned earlier that things change fast which is why getting in and out correctly and consistently is impossible. Between December 24th and January 30th of this year, the S&P 500 is up 14% from those Christmas season lows2. Cash since the beginning of the BULL earned 3.44%...CUMULATIVE TOTAL1. As discussed here, last year’s sharp movements were not unusual, however I imagine it simply felt worse given the backdrop of 2017 which sported the lowest volatility in history. The S&P 500 was up every single month in 2017 while not suffering a drawdown worse than 3%4. The average intra-year decline in the S&P 500 from 1980 thru 2018 has been 13.9% (price only) while still finishing positive in 29 of 39 years5. 2018 was a reminder that the stock market is not the economy. Corporate profits, largely driven by tax reform, increased by 26%. The anticipation of this boost was clearly seen in the markets in 2017 – even before they showed up in companies’ bottom line4. Investing is HARD! Will this BEAR market lead to a recession? In 1966, Nobel Prize winning economist Paul Samuelson famously said, “Wall Street Indexes (have successfully) predicted 9 of the last 5 recessions.” It appears there’s some truth to that as 20 of the last BEAR Markets only accompanied 11 recessions4. Even if we don’t call a BEAR in the S&P, there was a clear bear in several asset classes including US Mid-Caps, US Small-Caps, and International Stocks1. 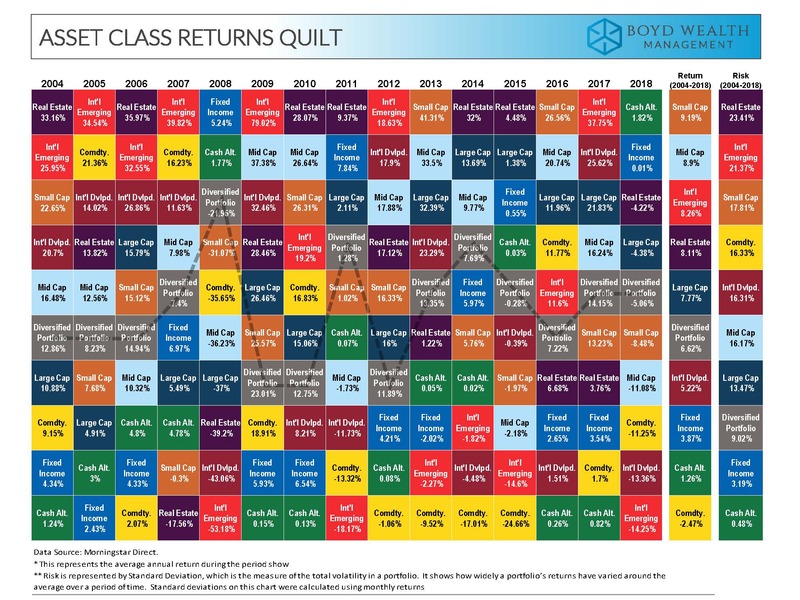 Looking at the Asset Class Return Quilt you’ll see in the 2018 column there really was no place to hide. Usually stocks and bonds zig and zag at different intervals. Sometimes stocks and bonds go down together, but it’s during these times that something else such as REITS or Commodities picks up the slack. Not this time as 2018 saw CASH as the top performing asset class with a positive 1.8% return. This has not happened in any of the previous 15 years. We now find cash yielding something meaningful with online banks and money market accounts yielding above 2%. A globally diversified balanced portfolio of 60% stocks/40% bonds finished 2018 down 5.0%. However, since the March 9th, 2009 low, a balanced portfolio has averaged 10.32% per year. Even if you take this back to the start of 2008 just before the financial crisis, a balanced portfolio has grown 4.3% per year6. Clearly outpacing cash and inflation. Down years happen and it’s impossible to predict this year’s winning country or asset class. Investing in CASH is a great way to avoid abrupt and painful downturns for money you need within a few years. A diversified portfolio has been a great way to grow wealth and beat back inflation for long-term money that needs to last as long as you do! We use the expertise of folks like our guest economist and several other reliable, well-respected sources to provide us with a snapshot of current conditions. Then we watch the data, research and monitor financial conditions, and then intensely focus on the HARD work - the Financial Plan. Having a financial plan is exactly what differentiates you from the masses of wandering souls. For his part, our guest economist Richard Herbert, CFA® delivered a refreshing take on the economy. Richard is an institutional portfolio manager for the Templeton Global Macro strategies at Franklin Templeton Investments. The US economy still appears to be in good shape but with slower growth as the most likely scenario. A healthy job market with accelerating wage growth has brought a healthy consumer who continues to spend, but growth here may be contained as fewer workers, less immigration, and a skills gap persist. Volatility in the fixed income markets (bonds) may be coming as the Fed continues to unwind its balance sheet. During Quantitative Easing, the Fed was buying bonds at any price. With the Fed no longer buying bonds, it remains to be seen who will pick up the slack in demand and at what price. Risks remain as the debt to GDP ratio has grown in US and EU countries since the global financial crisis. There are only four ways for a country to get out of debt: grow, inflate, default, or tax. While default is highly unlikely, the other three are definitely in play. Other risks to the ongoing expansion include a Federal Reserve that is raising rates, ongoing trade tensions with China (although Richard sees this threat as being overblown), and the UK Brexit mess. Emerging market currencies are presently priced lower than during the Global Financial Crisis. There are opportunities in emerging market government debt, such as Mexico which carries an investment grade rating and a current yield of 8%. While we don’t rush out and concentrate positions here, it does highlight that even boring bonds can bring potentially opportunity through active management. 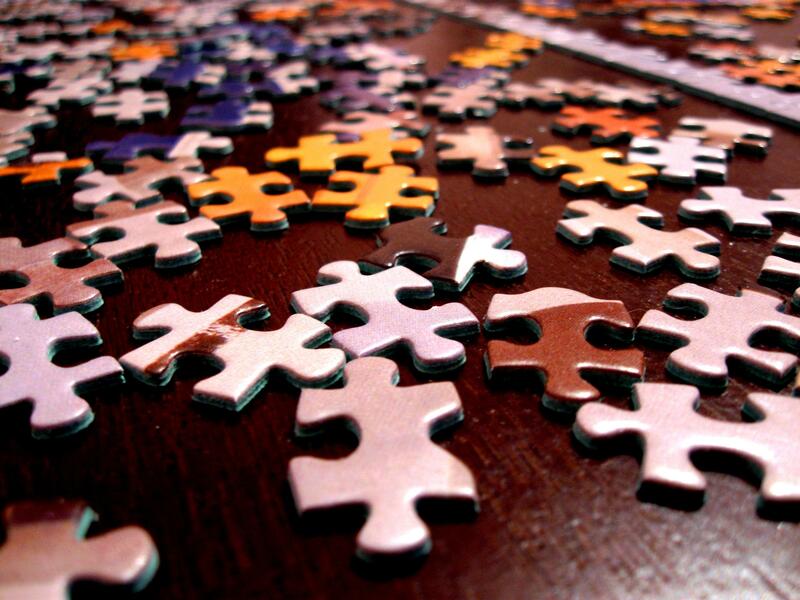 Reach out to discuss how any of these insights may relate to your specific plan. As we embark on a new year, I’d like to thank you for making 2018 our best year ever. Past performance of any investment discussed is not indicative of future returns. An index cannot be invested in directly. 2. Source Koyfin: Price data for equities and ETFs is adjusted for dividends and splits. That means that performance information is total return including dividends. Illustrated returns from SPY, QQQ, IWM, EFA, AGG and VSMGX include the underlying expense ratios of the ETFs, but do not reflect potential transactions costs or investment advisory fees. The S&P 500 Index is widely regarded as the best single gauge of the U.S. equities market. The index includes a representative sample of 500 leading companies in leading industries of the U.S. economy. The S&P 500 Index focuses on the large-cap segment of the market; however, since it includes a significant portion of the total value of the market, it also represents the market. The SPDR® S&P 500® ETF Trust (SPY) seeks to provide investment results that, before expenses, correspond generally to the price and yield performance of the S&P 500® Index (the "Index"). 6. AdvisoryWorld Scanalytics - The Vanguard LifeStrategy Funds are a series of broadly diversified, low-cost funds with an all-index, fixed allocation approach that may provide a complete portfolio in a single fund. The four funds, each with a different allocation, target various risk-based objectives. The Moderate Growth Fund (VSMGX) seeks to provide capital appreciation and a low to moderate level of current income. The fund holds 60% of its assets in stocks, a portion of which is allocated to international stocks, and 40% in bonds, a portion of which is allocated to international bonds. Investors with a long-term time horizon who can accept stock market volatility may wish to consider this fund.